With the arrival of cooler weather, it is essential to keep your home at a comfortable temperature. Fireplaces and wood burning stoves offer convenience and comfort to keep your family warm through the colder months. There are many different fireplace options out there from electric and gas to wood burning and pellet stoves. Here at Ace, we’ve put this convenient guide together to help you make the best choice. In homes where it is not possible to have a real fireplace, electric fireplaces offer a comforting option at a fraction of the price. These energy efficient indoor fireplaces are simple to install and grant owners the ambiance of a natural fireplace while taking away the hassle of a wood burning fireplace. An electric fireplace heater is portable and simply requires an electrical outlet to set up and enjoy. As a heat source an electric fireplace provides ample radiant heat, as well as a realistic flame, to keep you and your family feeling warm and cozy. When floor space is at a minimum, consider a wall mount electric fireplace which combines instant heat with a sleek, modern design. With the rise in traditional home heating costs, many homeowners are turning to wood burning stoves to add to and, at times, replace their existing systems. 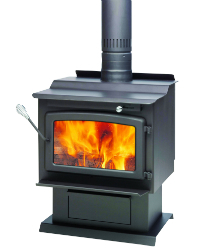 When deciding to make the jump to a wood stove, there are many options to consider. For instance, wood stoves come in three basic sizes: small, medium and large. It is important to first consider your floor plan and how much space you want to heat before making your purchase. As for material, a cast iron wood stove is a popular choice because it conducts heat efficiently. The wood used to fuel your stove should also be considered. Using hardwoods, such as oak, pine or hickory that have been cut for a longer period of time rather than freshly cut pieces will ensure longer lasting and more efficient burning. While very similar to wood burning stoves, pellet stoves use small, compressed pellets made of sawdust or recycled wood shavings as fuel. Pellet stoves use an auger that feeds wood pellets from a hopper into the stove where they create a clean and efficient burn. Wood pellets are far more affordable than other fuels such as oil, which makes them a popular choice for homeowners seeking heating alternatives. When choosing a pellet stove, consider a battery backup as this type of stove does require some electricity to operate its blower system. Adding a new fireplace to a home can be a considerable undertaking and is sometimes not a feasible option for most homeowners. Gas log systems are a great alternative to a traditional wood burning fireplace. Gas logs are low-maintenance and easy to install. They even produce a real flame to provide the comfort of a real fireplace. 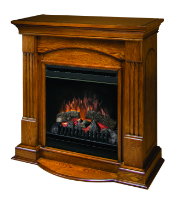 When choosing gas fireplace logs there are two options: vented and vent- free gas logs. Vented gas logs most resemble a realistic wood fire and require the use of a working chimney or flue. Because most of the heat provided by a vented gas log goes up the chimney, they aren’t very efficient. While providing less of a real fireplace feel, a vent-free gas log system keeps all the emitted heat in the home. A fireplace insert is an easy and beautiful way to spark new life into a home’s existing fireplace. There are many types of fireplace inserts available to suit your needs including: wood, electric and pellet stove inserts. A wood stove insert actually burns more efficiently than a real fireplace since the fire is contained in a firebox and radiates heat back into the room. An electric fireplace insert offers all the benefits of a wood burning fireplace insert, without having to worry about the upkeep. When purchasing a fireplace insert, be sure that it is the correct size for the fireplace and able to heat the specified area. Fire Logs and Starters: Manufactured fireplace logs are a popular alternative to real wood since they emit less smoke than real wood offering a cleaner burn. Fireplace starters allow for a hassle free start to your logs, giving you more time to get cozy and enjoy. Fireplace Screens and Spark Guards: When it comes to fireplaces, safety should always be considered. Fireplace screens or spark guards offer protection by keeping embers and sparks in the hearth. Fire screens also help to prevent too much heat output caused by the fire. Fireplace screens add a decorative element to your fireplace while keeping your home and loved ones safe. Fireplace Grates: If you have a wood burning fireplace, a fireplace grate is an essential addition. A fireplace grate keeps logs off the surface of the fireplace allowing for an even and efficient burn. Fireplace grates also prevent logs and other material from rolling out of the fireplace and causing a potential fire hazard. A stand is typically included with your tool set for convenient access. Fireplace tools also come in a variety of designs to compliment your home’s style. 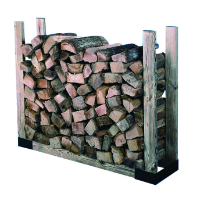 Log Racks and Holders: A log rack is an essential addition to any wood burning fireplace set up. A wood holder keeps your firewood organized and easy to access when needed. A larger log holder is great for storing wood outside, but be sure to get a log rack cover to keep your fuel protected from the elements. Smaller log bins or totes are available to keep a few logs indoors to easily add to the fireplace when needed. Heating Needs: The first step before buying a wood or electric fireplace is to consider your heating needs. The size of the space you are trying to warm will determine the size and style of fireplace you will need. Another factor to consider is whether you are using the fireplace to supplement or replace your existing heating system. If you are replacing your current system, it would be wise to purchase a large wood burning cast iron stove since they are known to produce the most radiant heat to cover a large area. Style: Your home’s décor plays a major role in the style of fireplace you will select. If your home has a more rustic feel, a classic pot belly stove would certainly fit the bill. A wall mounted electric fireplace will add a sharp touch to any modern or contemporary styled home. Electric fireplaces also work well in modern styled homes, but also compliment a more vintage feel. As you can see there is a fireplace for just about any style! Fuel: If you are considering an electric fireplace, the only fuel you’ll need is electricity. The fuel decision comes into play when deciding between a wood or pellet stove. Wood burning stoves require an ample supply of seasoned wood to fuel your fire on cold winter nights. A storage area for your wood is also something that needs to be addressed when thinking about wood fireplaces. 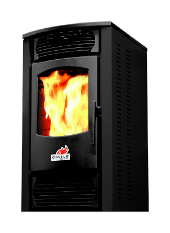 A pellet stove requires small wood pellets to get the fire going. These can be conveniently purchased in bulk and don’t require much storage space. When considering gas logs, an existing or added natural gas line is essential to heating your home. When using any type of fireplace, safety should always be at the forefront. Here are some tips to safely enjoy your fireplace. The fireplace is the centerpiece of comfort and beauty in the home. Choosing the best wood burning or electric fireplace will give you years of enjoyment in a relaxing setting. By using this fireplace and stove buyer’s guide, we hope making the right choice will come easily.